Translation: "Toward this; for this [specific purpose]." 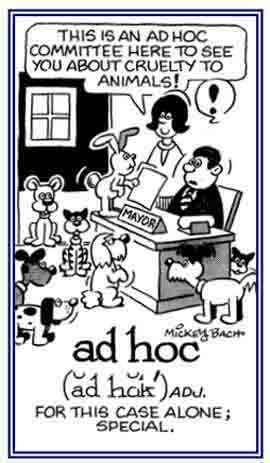 The term ad hoc has several applications: for a special purpose, for a particular reason or occasion, or for the present matter or situation; all of which applies only to a specific case that should be resolved. An ad hoc committee is one whose existence is limited to the time that is necessary to take care of an issue that is currently being considered; then, when the problem is solved, the committee will go out of existence. To the point of horror. ad hunc locum; ad.h.l. ; a.h.l. To the same [point or effect]. 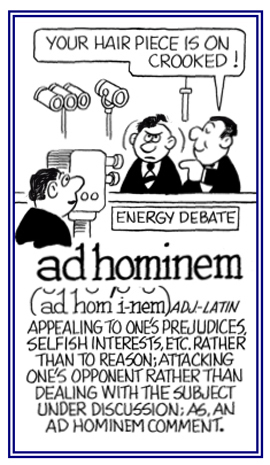 In agreement; at a meeting of the minds: "She said, the parties were ad idem." After the fashion of; like. At pleasure; according to one's pleasure; freely, unscripted, improvised; extemporaneously. This is usually shortened to ad lib. [with or without a period]. 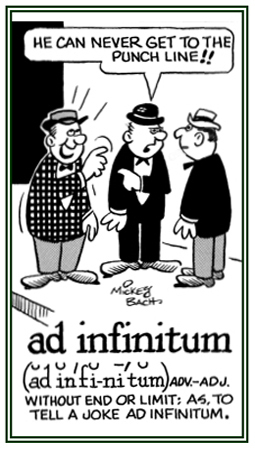 Ad lib is used both as a verb and as a noun. When used in the entertainment world, to ad lib means to improvise, to add an impromptu word or statement to a script. 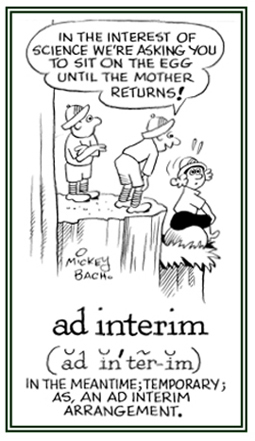 As a noun, an ad lib is an "off-the-cuff", or unprepared, remark. It is said that there are some politicians who have "carefully planned ad libs". To the thresholds of the Apostles; to the highest authority. This applies to matters appropriate for papal consideration and disposition before the tombs of St. Peter and St. Paul. It is often abbreviated ad limina and is used in non-church situations to mean that a dispute must be settled by a higher authority. For the suit or action. Used in law as a decision that is taken as valid only for the action being adjudicated and is a reference, for instance, of a guardian appointed to represent someone incapable of acting for himself/herself during the court case. To the letter; precisely; exactly: "Jason instructed his secretary to retype the letter ad litteram or exactly as it is now." Showing page 3 out of 12 pages of 168 main-word entries or main-word-entry groups.